Gigantic Angel Zone is the seventh Zone of Sonic Pocket Adventure, which sees Sonic infiltrating the Aerobase's interior. 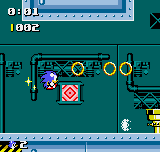 The level graphics seem to mostly be inspired by those of Sonic 1's Scrap Brain Zone, although a few things are borrowed from Sonic 2's Metropolis Zone, such as the yellow bumpers on the wall, the high-speed pipes for Sonic to travel around in, the pistons that launch Sonic upwards, and the lava. All the Badniks are from Metropolis Zone as well. The second Act opens with a cutscene where Sonic runs forward and sees Dr. Eggman, now sporting his updated look from Sonic Adventure, who pulls a lever to drop Sonic into the dangers below. This is similar in fashion to how he dropped him into the third Act of Scrap Brain Zone. The music for both Acts come from the Zones present in Sonic the Hedgehog 3's Competition Mode. The first Act's music is from Desert Palace Zone, and the music in the second Act is from Chrome Gadget Zone. This page was last edited on 2 April 2019, at 12:51.